The Star represents the Higher Self in harmony with the lower self. It depicts the depth of inner consciousness that is attained through meditation. 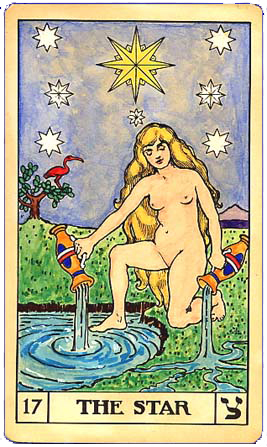 The Star card and the sign of Aquarius teach us to release our fear of isolation and to love and serve humanity. Promising truth, beauty, understanding and hope for the future. Ruled by Uranus, it is the flow of cosmic energy coming to earth to be made manifest. Confer with The Star to increase self-confidence or to generate a new flow of energy and resources. The Star image on journals, T-shirts, and mugs.